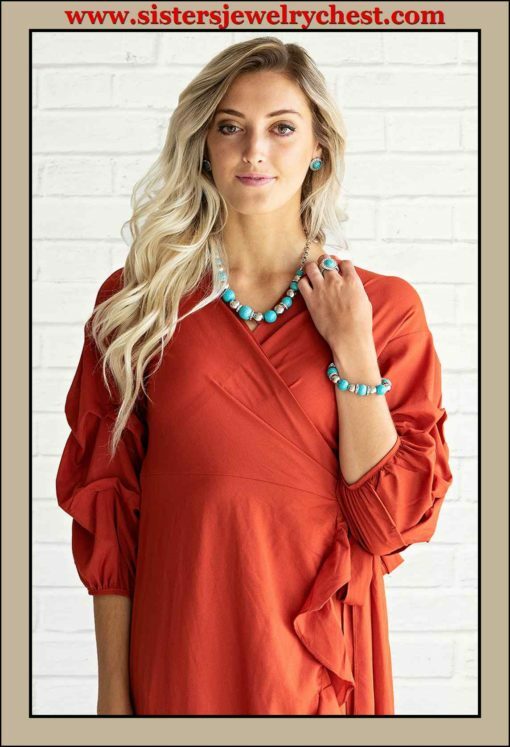 Necklace: “The Ruling Class” A strand of faux turquoise stones, shiny silver beads, and white rhinestone-encrusted rings falls below the collar in a refined fashion. Features an adjustable clasp closure. Includes one pair of matching earrings. Earring: “Saharas Finest”A refreshing turquoise stone is pressed into the center of a round silver frame radiating with glassy white rhinestones, creating an earthy, yet refined design. Earring attaches to a standard post fitting. Bracelet “Ruling Class Radiance” Faux turquoise stones, shiny silver beads, and white rhinestone encrusted rings are threaded along a stretchy band and wrapped around the wrist for an elegantly earthy finish. Ring: “Rugged Radiance” A refreshing turquoise stone is pressed into the center of a round silver frame radiating with glassy white rhinestones, creating an earthy, yet refined design. Features a stretchy band for a flexible fit.